First, I don't know if I'm posting this at the right forum, maybe it belongs to Beginners, if that's so, feel free to move it. My brother gave me about two months ago a pair of keychain photoframes (the brand is NPlay, but it can be found under other brands), that he had bought for 2€ each as a bargain in Worten, along with the datasheet for the ILI9163 that he suspected could drive the 1,5" screen, and a URL:http://www.waitingforfriday.com/index.p ... Photoframe . Here the author, Simon Inns, explains how he deduced the pinout and built an Atmel C library to drive the screen. Well, I don't know much C and I'm trying to learn Python right now. 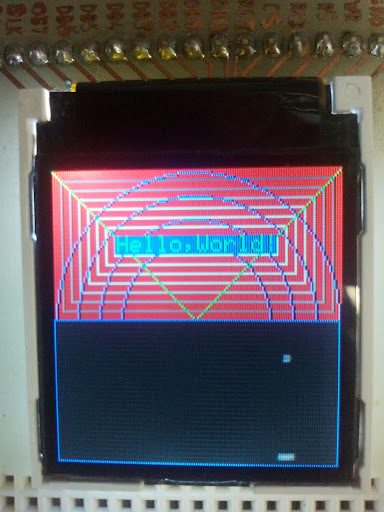 I thought that porting it to Python for the Pi would be a fun way to learn, so I desoldered the LCD (breaking one of the two in the process) and made an adaptor PCB following Simon's Eagle CAD project. The syntax is not very dissimilar, but there were two minor problems: first, Simon used in the C code direct (parallel) writing to the GPIO registers (the LCD controller is hardwired for parallel input),something that it's not available for Pi Python, and that forced me to use loops to write to the controller with GPIO.output, 1 bit at a time. And second, he used 8 bit (short) integers, so I had to use some creative bit operations to do 2-byte writes with Python integers. I could have used char variables,but I was translating the code directly. To my surprise, my code works, I can print text, dots, lines, rectangles, filled rectangles and circles (all Simon's work, I just ported it), but very slowly. The clear_display function takes about 4 seconds, filling the display with text about the same. The bat and ball animation in the last part of the program runs at reasonable speed, but just running it the CPU load climbs to 100%. I would like to use the display at the front of my Pi-formerly-old-DVB-T-case to select menu options with some switches or a digital joystick (for example, I would like to run a headless raspbian with a MIDI synthesizer, maybe fluidsynth, and tweak it to select the GM instrument and volume, so I could carry my USB MIDI controller and the Pi and practice anywhere... before that I have to learn lots more), but I think it's a little slow for that right now. The question is: is there some way to speed up the code? I'm sure that someone with more Python knowledge than me (nearly everyone) can give me some clues. The easy answer is overclocking, but my Pi is already running at 800 MHz and I don't really want to overclock it more, anyway the speed gain would be small. Keep in mind that I'm beggining to learn Python, so I assume that my code is..... let's say improvable, as my english is. # it wraps to next text line to same starting x coord. @Antares (and Simon) well done getting this to work. In fact, brilliant work both. I can't see anything obviously inefficient in your (@Antares) code but I can make the following comments. there are some sleeps in there, but only the same as in the original C so that shouldn't make any difference. You need to use "for x in range(7,-1,-1):" an awful lot and python is temporarily creating a list each time along with an additional function call to range() I would create a global variable BITS = [7, 6, 5, 4, 3, 2, 1, 0] and then use "for x in BITS"
You could convert your code quite easily to C compiled using cython, mainly you will get a big speed increase from defining types for the variables so the python interpreter doesn't have to keep checking! Hi, @paddyg, thanks for your answer. I didn't expect a reply after a week, and I was thinking of posting again, this time in the Python forum. I didn't knew about loops using range being so time consuming, I think I thought in terms of BASIc for...next. I'lll try your solution and I'll post the results. Also, I didn't new how to profile Python, I'll try it too. And talking about this, do you know of a debugger? I'm using Geany as an IDE on the Raspberry, and I've seen nothing about that. I've debugged the code old school style, using print and raw_input. About splitting the code, I thought that for posting it, it would be easier in a single file, I'm aware that it's more readable as separate files. I've heard about Cython, but never tried it. I'll give it also a go. I'm right now converting the circuit to I2C with a PCF8574, I want to see if serial writing makes a difference. Of course, first I have to learn how I2C works (and I have ordered a couple of SPI chips, also). Thanks again, you have given me something to think about for at least a week. I'll keep you informed of the improvements. @Antares, I suspect that with a bit of streamlining with the set_char as outlined it will be much improved if, as you say, the bat and ball thing looks to run at a reasonable speed. (edit) I did do a test as some stage and the actual GPIO.output() takes a tiny amount of time, micro seconds. So I thinks it's just a matter of cleaning up the loops in python. range() isn't really slow but it's a function that generates a list so each time you call it there's a little bit of overhead. In py3 it works as an iterator that generates the numbers you require as and when. I don't know how efficient the python interpreter is. Where there is a loop with static values like this it might (should) do something more efficient, even in-lining it. Easy enough to try variations till you find the fastest. As you do those 8 step loops lots of times you might check whether you would benefit from unwrapping them completely i.e. 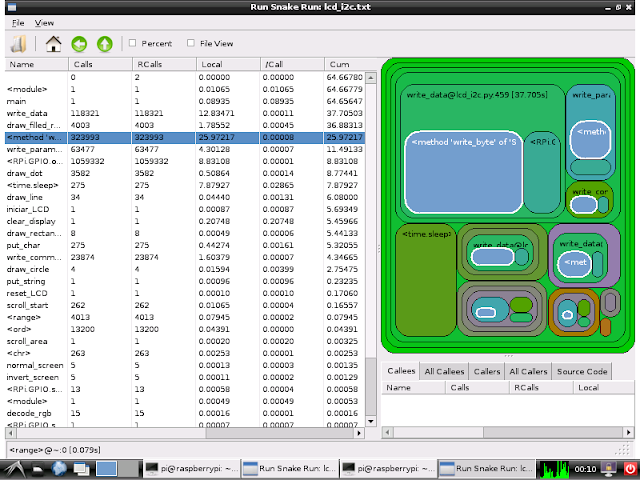 I use geany, there is a python debugger 'import pdb' but I've always found it sufficient to stick 'print..' in as you've been doing, to see what's happening. It's a convoluted code, using arrays, for .. in range loops, bit shifting, etc..
A strange thing about this profiling is that about two thirds of the time spent executing write_data is not used writing to the GPIO ports. The only thing that remains are the bit operators (databyte2&128....). It was a surprise to me, I thought that GPIO writing would be the big roadblock. It's a little faster than the improved parallel code, but not much, say a 10% faster. So I'm now at a dead end. I think I'll try Cython, as suggested also by @paddyg, and maybe WiringPi2, I hope that one of the two will make it usable. If not, it's time to learn C.
@Antares, this is all really good stuff. 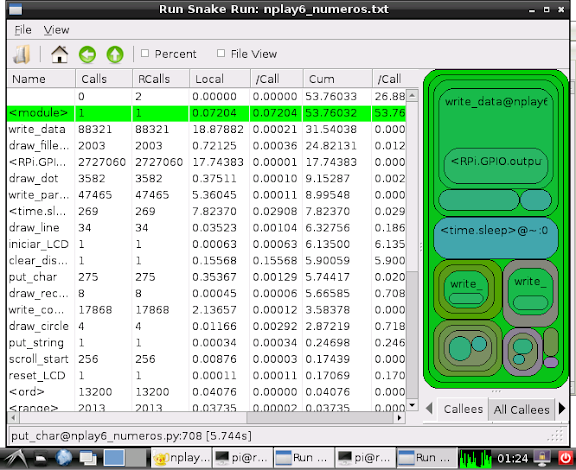 I like the runsnakerun graphical outputs. Did you try upping the speed on the GPIO version? Cython would definitely be worth a go. Even if you wanted to include some C code (i.e. some of the original stuff you converted to python) using Cython as a wrapper for it is a very good way of making it accessible from python. But I think, with a bit of care and suitable type defs, you can generate C code from python that will run just as fast. One thing I meant to mention before: install git and keep a remote repository on github, bitbucket google.code. There's a bit of a learning curve but it's worth it, it means you can let other people see the code easily, they can contribute if you want and you can branch different versions such as when seeing what's quickest. Also it's a backup system so you don't loose all that hard work. may be better with faster clock speed. Paddyg, I don't understand your question about the speed with the GPIO version. What I've changed between the two wersions with I2c is the frequency for the I2c clock( how fast the clock pulses in SCL go), and that doesn't apply to GPIO (As I've got just one pcf8574, the lcd data inputs are now managed with i2c, but control inputs are still managed with GPIO.output) For me, it tops at 600 KHz with my setup; as you can see in the photos above, I use an IDE cable about 30 cm. long, plus jumper wires in the breadboard in two sizes, the longest are 15 cm. I imagine that in a real working environment, with short wires (less capacity), decoupling capacitors in the i2c signals and a properly shielded pcb, I could use higher frequencies. I'm seeing in the oscilloscope some serious overshoot in the rising edges, but the circuit seems to cope with it, I don't get any errors on the lcd up to the point, at 700 kHz, where the PI throws an Input/output error and refuses to run. 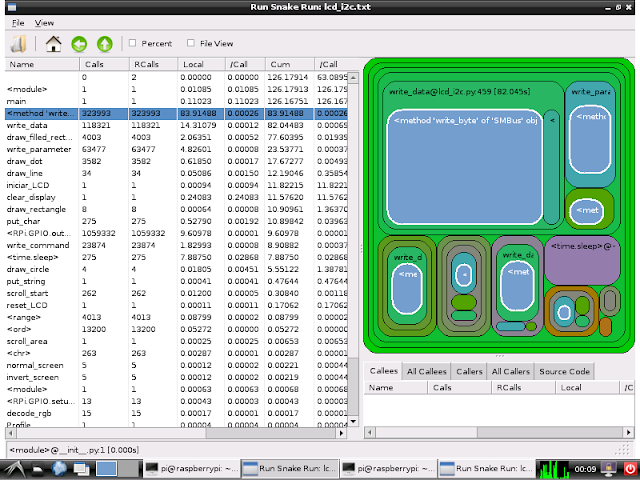 One thing that I forgot in my last post was that your suggestion to reduce the number of decode_rgb calls was also a big speed boost, as can be seen on the runsnake profiles. I've precomputed values for red,yellow, green,blue,cyan and magenta, and use them all along the code. Me being stupid. There is a clock function somewhere on the GPIO but I don't think it has any relevance to output and input. Ignore it! With cython calling the RPi.GPIO there is probably an overhead converting to and from python. To speed it up properly you probably need to encapsulate a very small C function, you could install bcm2835 other ideas here. i.e. it's about 150 times as fast! The other thing that I haven't investigated is that it looks as though the output writes to all pins at once but is masked by a (1 << pin) so presumably it could do a parallel write more easily, which would be 8 x faster! printf("mmap error %d\n", (int)gpio_map);//errno also set! for some reason this puts the domgert.so in a created subdirectory with the same name the current directory so I have to copy it up a level! There's probably a perfectly good python reason for this! That looks very promising, Paddyg. I will be in a trip from tomorrow to Sunday, but I'll look at it as soon as possible. I'll have to start learning something about Cython. And I think you're right about the parallel write, if you write directly to the GPIO register and then enable it, it changes all the GPIO outputs at a time. Simon's original C code for the Atmel used it. I really think that the GPIO Python library should include some kind of parallel write (and read) instruction, since it's possible in C. Let's see if I can cobble together something useful, but I know even less C than Python. Yes, it certainly gives quite a boost. Of course I'm doing the 500,000 loops in Cython (aka C) so it's very fast (but that's what I was doing on my first speed up comparison too). When I make the loop in normal python I get an average of 2.59 micro seconds per gpio.output, so slower but still *much* faster than 16 micro seconds. Also that last (2.59mics) time was for a slightly different version where I basically took the c_gpio.c from Ben Croston's (i.e. the standard RPi.GPIO library) here I then didn't alter a scrap of code, just put a simple Cython wrapper on it. This is a bit slower as Ben doesn't seem to have built the gpio_output as a #define macro and he does a / 32 and % 32 to stop writing into random memory. I might look at converting all of Ben's library to Cython as there might be occasions (such as your screen driver) where the speed will be significant. PS my raspberry pi doesn't have all those pins, they stop at 27! 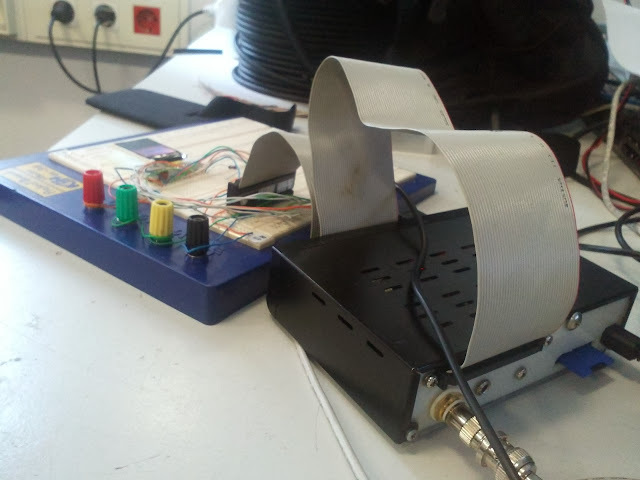 Paddyg, I have just returned from a 3 day trip (extended weekend here in Spain, friday was a national holiday) and I haven't had the time to look at your solution, just a quick note: I have GPIO 28, 29, 30 and 31 because at the GPIO port at the back of my home-made case, I have connected P1 and P5 from the Pi, in P5 (in rev. 2 boards) there are the 4 additional ports. As I use a 40 pin standard IDE cable, I even have some pins free for future uses. Since my last post, I've been trying to speed up the code converting it to Wiringpi2, and I think that it has reached the point where it's usable, in terms of speed. I chose Wiringpi instead of Cython because, a) I don't know C and I'm still learning Python, and b) Wiringpi offers some functions to directly handle I2C and SPI expanders (that will be the next step, because, while in some cases it's OK to use 8 GPIO for the data bus and 5 more for the control lines, in many others it lets you with too few GPIO for other devices). And this is the Wiringpi version. As can be seen in the images, the write_data function spends 210 uS on the GPIO version, and just 90 on the Wiringpi version. As profiling makes the execution slower, I wrote some calls to time() at the beginning and at the end of the clear_display function, and before and after the code that fills the screen with text. I found that (with some variations) clear_display takes now about 1.1 secs., and filling the screen with text about 1.2 . It's a good improvement over the near 4 secs. to clear the screen that I started with. 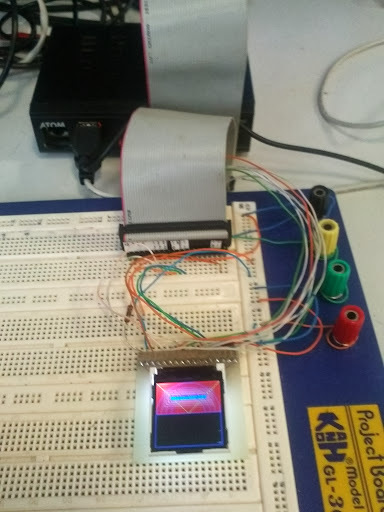 As I said, the next step will be using again the PCF8574, this time with Wiringpi (I think there is already an extension for this chip in the library). Then maybe I will try Cython, I have no doubt that it will be faster, but also a little more difficult to implement. Last edited by Antares on Mon Nov 11, 2013 12:02 pm, edited 1 time in total. @Antares, I am continually impressed both by your assimilation and application of python and your flawless English. You will benefit from following the path you describe in that you will have viewed the same problem from (almost) all possible angles. The Cython option doesn't really involve any C as such (as I said, I just copied the existing .c files into my directory unaltered) but one of the reasons python is slow is that it lets you not bother to define your variables up front but checks what type they are every time they are used. Cython allow you to use cdef to avoid this checking. I think you will find that you can easily get 2,000% speed increase this way, possibly much faster if you include a write_byte function. PS all the gpio functionality involves the same basic chunk of code as I linked to before whether it's wiringpi or bcm2835 or RPi.GPIO the only way to speed it up (from python) is to either offload the work to another board such as you propose (or an arduino type) or to reduce the type checking process being done by python.